Jan 26, 2015 @ 10:10 AM — by Sharon B. Mateja, D.D.S. Dr. Sharon B. Mateja proudly serves patients in the Rancho Cucamonga area, offering advanced restorative dentistry treatments that improve dental health and general wellnes. For complicated cases, sometimes a single restorative therapy is not enough. In such matters, a full mouth reconstruction may be most ideal, which we'd like to focus on right now. 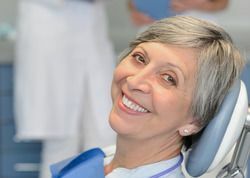 A full mouth reconstruction refers to a combination of general and restorative dentistry treatments that are designed to address major dental health problems. Thanks to this combination of procedures, a patient's dental health can be greatly improved and enhanced. Ideal candidates for full mouth reconstruction are people who suffer from major dental problems that cannot be treated through a single treatment on its own. Many times there is a complicated combination of problems that are the result of poor oral hygiene or major injuries. People who suffer from varying degrees of tooth decay and tooth injury can benefit from undergoing a full mouth reconstruction. The use of fillings, inalys, onlays, or crowns can make a major difference when it comes to the health of a patient's smile. When a person suffers from gum disease or gum recession, proper periodontal care is just what they need to restore their health. Treating gum disease tends to involve a combination of antiseptic rinses and antibiotics, while gum recession is often treated by performing soft tissue grafting and augmentation. When people suffer from tooth loss, it's important that the gaps be filled so the appearance and function of the teeth can be restored. The use of dental bridges and dentures is ideal in a number of cases to treat tooth loss. In some cases, the use of dental implants may be ideal. These are artificial tooth roots that are surgically anchored into place in a person's jawbone/jaw joint. The implants can be used to support all kinds of dental restorations, with a level of stability comparable to natural tooth roots. Root canal infections are the result of bacteria entering the center of the tooth where soft tissue known as dental pulp is found. Root canal treatments will involve the removal of the infected dental pulp, which relieves the pain associated with the infection and prevents major health issues down the road. The temporomandibular joint (TMJ) is one of the most complicated joints in the human body. TMJ disorders are the clicking and popping of the jaw joint, which can be quite painful and lead to more problems down the road if left untreated. TMJ disorder treatments will help address various issues with the parts of the jaw joint to improve dental health. No two patients are the same, so every full mouth reconstruction is carefully customized to meet the needs of every patient. During the consultation process, we will be more than happy to go over which treatments would be best for you and your needs. To learn more about full mouth reconstruction treatment and how it can help you have a great-looking and health smile, be sure to contact our cosmetic and restorative dentistry center today. Dr. Mateja will work closely with you so that you can receive the treatment you need in order to have the best smile possible.